Wish to download and save all the tens of thousands of Tweets you’ve made in the past few years on Twitter? It looks like you might be able to do it really soon because several Twitter users have already reported receiving such feature; Twitter has also confirmed that they are working on it and have rolled it out to a very small percentage of users. 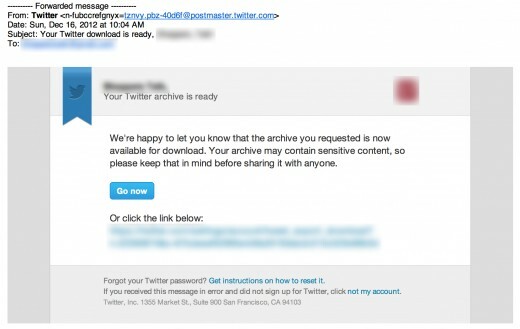 Over the past few days, several Twitter users reported that they received an option to download all their tweets. One user, @Psilosophy, tweeted that he received that option under the settings page of his Twitter account. Another user, Navjot Singh, said that once the download is available, he received an email from Twitter that contained a link of the download. The archive will be downloaded in a zip format and when extracted, it contains a HTML file that opens up a page similar to Twitter’s design. All your tweets will be sorted out by months. Other users are reporting that the archives also include CSV and JSON files. Are you looking forward to the feature or will you, like @Psilosophy, be utterly embarrassed to see what you used to tweet about when you first started?